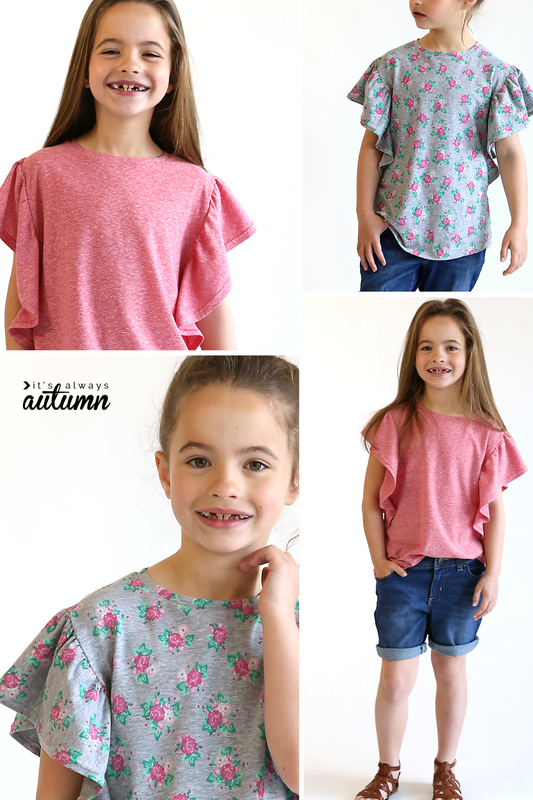 In today’s post: Download the free waterfall top pattern for girls in size 7/8 and sew up a pretty ruffle shirt! 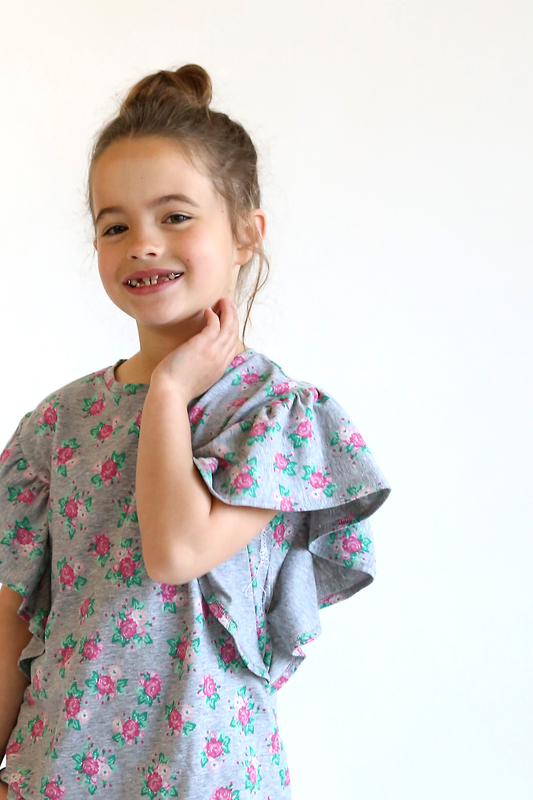 The past few years I’ve had a tradition of sharing a new girls’ top and/or dress pattern each spring. I started with the Flutter sleeve pattern in 2015, then shared the Play All Day pattern (6 sizes!) in 2016, then the Hello Spring dress and top last year. Most of the patterns I share only come in one size – whatever size my daughter happens to be right now – because I share them for free. 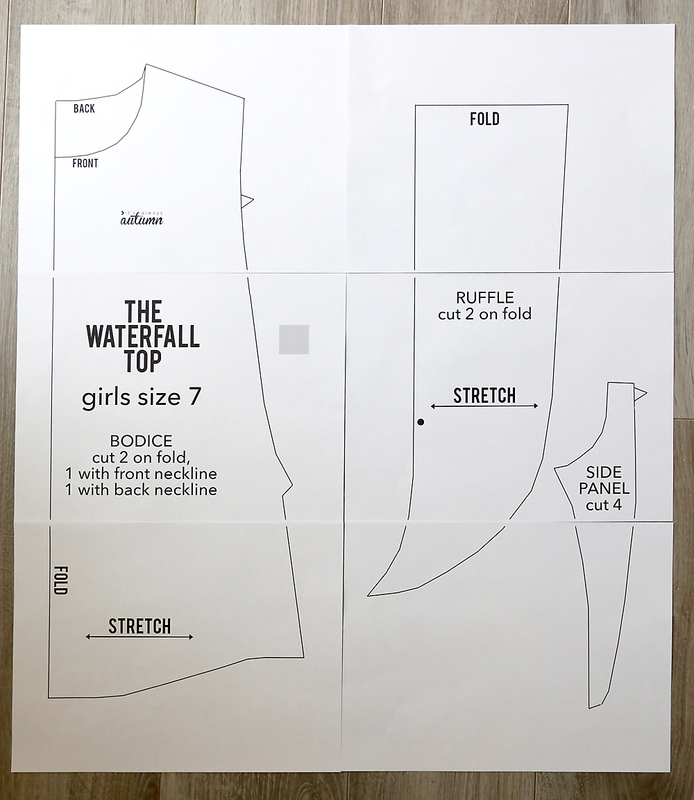 Today’s new pattern is The Waterfall Top and it’s in a size 7/8. I think it would actually work well as a dress with a few inches of length added on. If I give it a try I’ll let you know! I’m calling this pattern “The Waterfall Top” because of the way the sleeves fall in a pretty wave. It’s a pretty top, but since it’s made out of knit it’s just as comfy as a normal t-shirt. 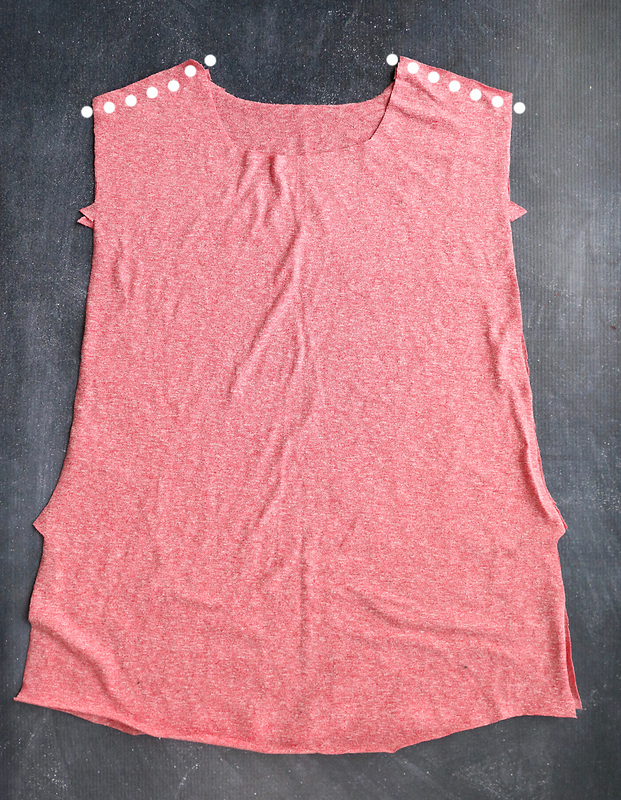 And it’s really not much harder than a normal t-shirt to sew! 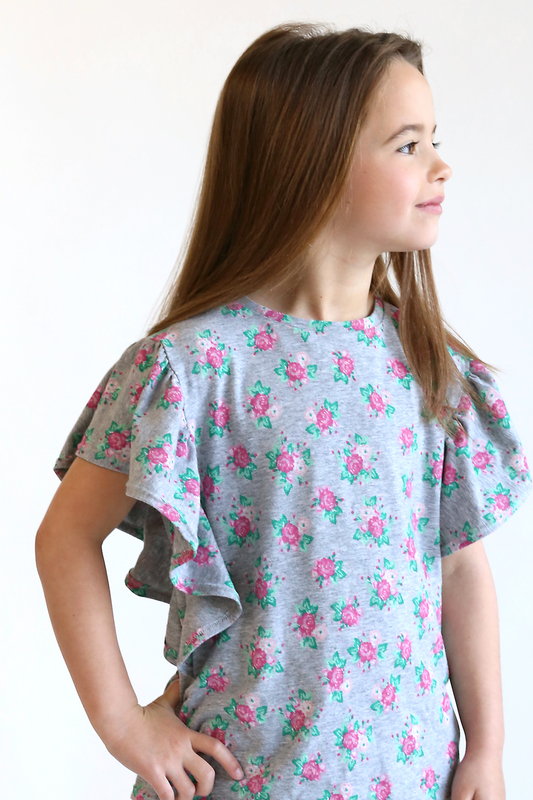 You’ll also notice as you look at the two shirts I made that the sleeves on the grey floral have more gathers, making them look more ruffled, while the sleeves on the pink top have a more gentle wave to them. This is partly because I adjusted the pattern after I sewed the grey top to take some of the gathers out – I like the gentle waves better – AND because the same pattern can look a little different sewn up in different fabrics. Both of these are knit fabrics, but the grey one is much more stable – not as stretchy – while the pink one is a little thinner and more drapey. I like how the pink one turned out best, so I’d recommend a fairly drapey knit. Just steer clear of very thin “tissue” knits because they are REALLY hard to sew. Click here to download the printable PDF pattern. It prints on 6 sheets of 8.5×11 paper. Be sure you are printing at 100% and check that the test square on page 3 measures exactly 1 inch. One neckbinding piece (not included on pattern): it should be 1.75 inches high by about 16 inches long, and stretch needs to be along the length of this piece. You’ll start with the ruffle pieces. Note that there is a dot on the ruffle pattern piece. Place pins on the ruffles to mark where that dot hits. The pieces look a bit like canoes; you will hem along the bottom of the canoe. Turn up 1/4 to 1/2 inch and press, then hem using a double needle or zig zag stitch. Because the sleeves are “fluttery” you will sometimes see the underside of this hem, so try to make it as tidy as possible. This is what the ruffle pieces look like once they are hemmed. The dots on the photo below show the pins you put in to mark the dot on the pattern. You will ALSO place a pin to mark the center of the ruffle pieces, as shown below. You are going to sew two rows of gathering stitches that go from the left pin all the way to the right pin on each ruffle piece (you can remove the left and right pins once you have sewn the gathering stitches, but leave the middle pins in). Gathering stitches are a straight stitch that has a long stitch length and a low stitch tension. Set aside the sleeves/ruffles for now, and grab the bodice pieces. Place the front bodice piece on top of the back bodice and sew together at the shoulder seams, right sides together. Now you’ll open up those bodice pieces and lay the shirt on a flat surface, right side up. In the first photo below you can see there are two notches near the shoulder seam, plus two more notches further away from the shoulder seams. These are going to help you line up the pieces you will sew next. Grab one of your ruffle pieces and place it right side down onto the bodice, matching the pin in the middle of the ruffle to the shoulder seam. Pin pieces together. Now pull on the bobbin threads of the gathering stitches to gather up the ruffle until the ends of it hit the wides notches (the ones further away from the shoulder seam). Distribute gathers evenly, and pin the ruffle to the bodice. Don’t sew yet! Next you need to grab two of the side panel pieces and lay them over the ruffle. The notches near the top of the side panel pieces will match the notched on the bodice that are close to the shoulder seam. 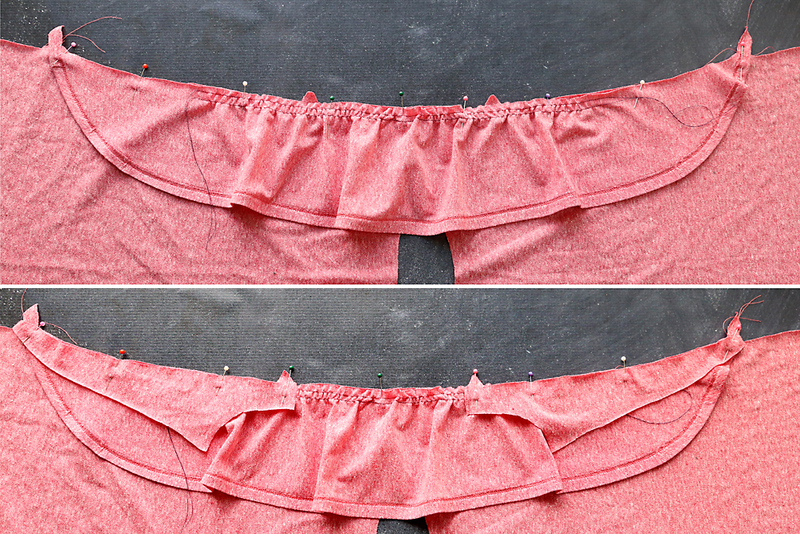 The ends of the side panel pieces will match up with the end of the ruffle (see photo above). The side panels should be placed with RIGHT SIDES DOWN. 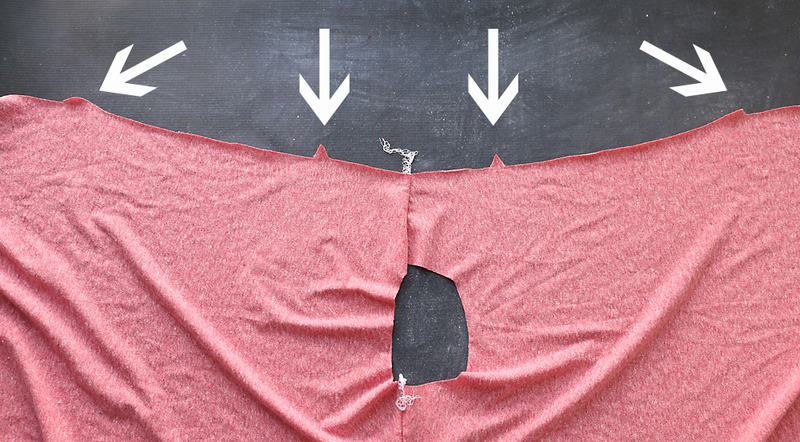 Now you can sew one long seam that sews all three layers together. It’s easiest to do this on a serger and will look tidiest. If you don’t have a serger, I’d recommend sewing a straight seam, and then going back to finishing the raw edges of the seam allowance with a zigzag or overlock stitch. Pin together and sew down the side seams. 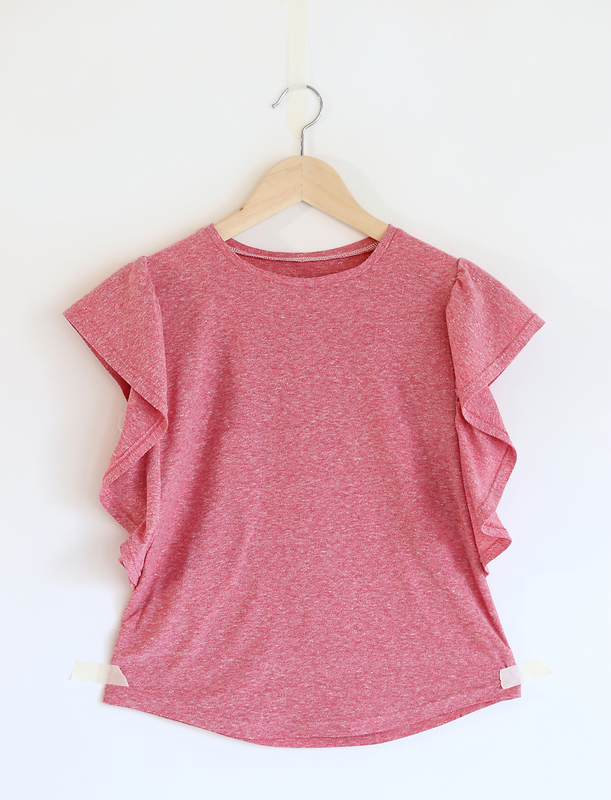 You will sew over the seam that attaches the ruffle to the shirt. Next you need to finish the underarm. In the first photo below, you can see what the armhole looks like now – it has a seam on the top and a raw edge on the bottom. 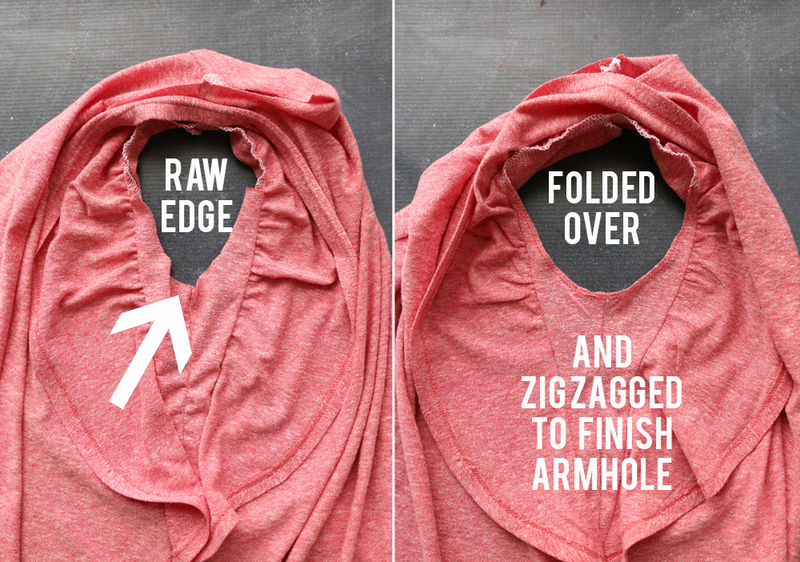 Just fold that raw edge over 1/4 of an inch and sew it with a zig zag stitch to secure. At this point all that’s left is attaching the neckbinding and hemming the shirt. 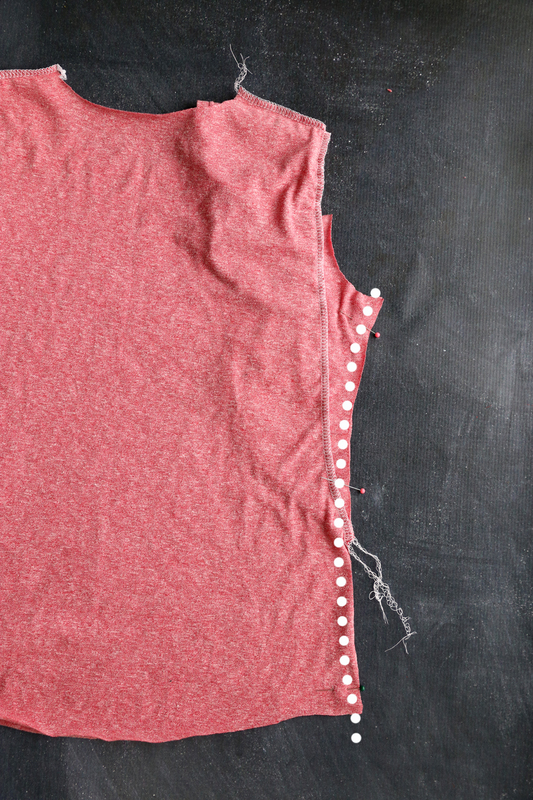 I recommend using a double needle for hems on t-shirts, but you can also use a zig zag stitch. 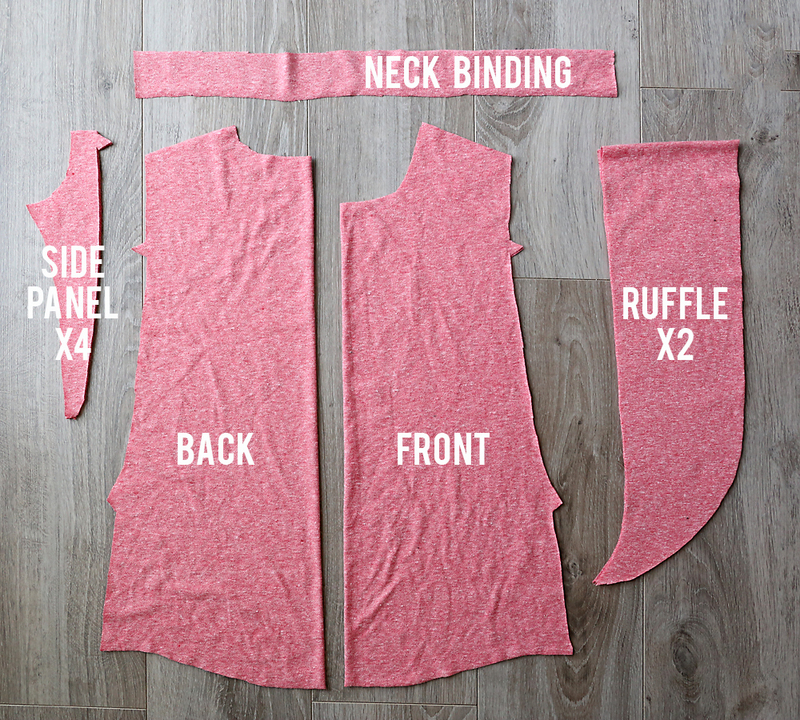 If you need help with the neckbinding, visit my classic t-shirt pattern post for more instructions (remember, you cut the neckbinding to 16 inches but you will not use that whole length – the instructions in the other post will help you figure out how long the neckbinding actually needs to be). This is so cute, almost as cute as your little girl! I will saving this for when my grandaughter gets bigger. Will this be coming out in a woman’s version? So super cute! Thanks for sharing the how to. 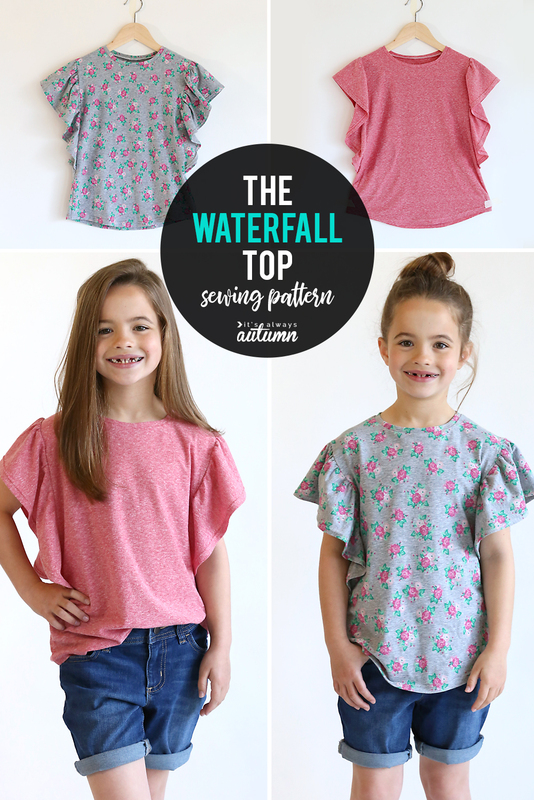 I love your free patterns, they style is always perfect for me and my girls! And when did your cutie get so big?!? These turned out so cute! I really want to try these out, they look pretty simple! This is a great pattern! I’ve got it all cut out to make a top for my niece. I’m wondering what seam allowance you’re using? Love this pattern. I already made 5 tops and working on dresses. Easy to follow instructions even for a newbie like me. Because of the simple, yet elegant silhouette of this top/dress, I can create uniquely different-looking clothes with different fabric. Highly recommended, especially for someone who is not used to swing with knits. Hey, thank you! I’m glad you’ve liked it. I just made a dress with it as well that I’ll be posting in a couple of weeks. good afternoon, can not I print the pattern?